The New York State Department of Transportation (NYSDOT) has been busy in Melville. The first of three projects (extending 1.74 miles along NY Route 110 between the I-495 South Service Road to Arrowwood Lane) slated for the area is complete (outlined in red in map). The present $55,700,000 project (outlined in orange) involves the reconstruction and reconfiguration of the intersection of Rt. 110 and Northern State Parkway. The money for these projects comes from the state and federal government. It is anticipated this project will complete in 2013/14. The overpass, built in 1946, will be replaced with a wider one with improved acceleration and deceleration lane lengths for vehicles entering and exiting the parkway and provide safety and mobility improvements for motorists, bicyclists and pedestrians. The majority of the work is scheduled to take place at night. This website has more information about this project as well as a map of the reconfiguration (at left). Click on the map for a larger version. 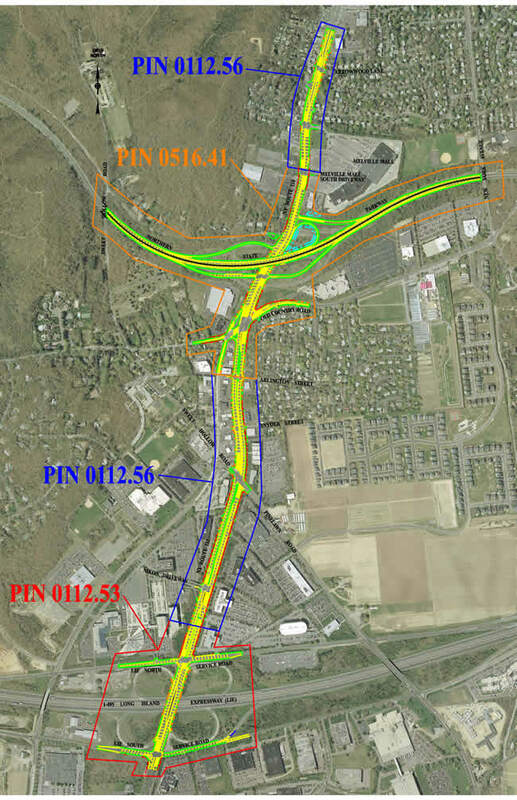 The NYSDOT says they have developed a proposal that will provide a safer, more effective roadway while maintaining the aesthetic and historic character of the area. A 1 mile (1.6km) segment of the Northern State Parkway between the Sweet Hollow Road and New York Avenue bridges, as well as the main intersecting side streets of Old Country Road, Walt Whitman Road, Pinelawn Road/Sweet Hollow Road and the LIE Service Roads, are included within these reconstruction projects. In the Spring of 2013 the $29,400,000 third phase (outlined in blue) of this project is slated to start. 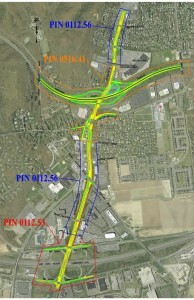 The third phase will cover the widening of sections of Rt 110 adjacent to the first two projects.